Memorial service held for Gardena Police Officer Toshio Hirai. 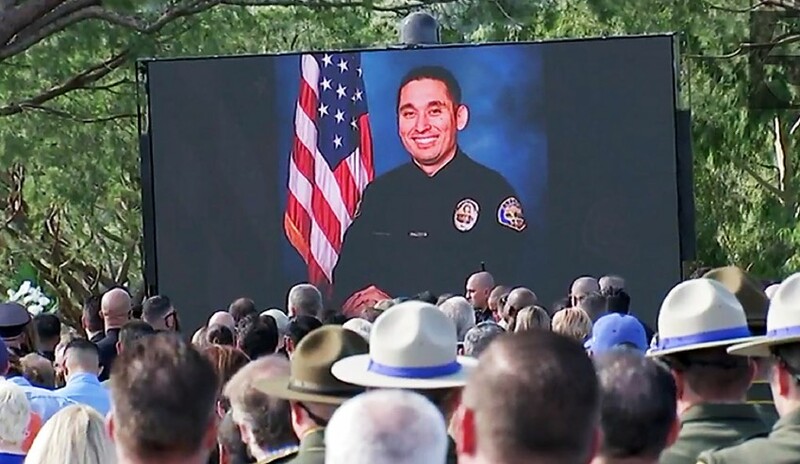 A video of Gardena Police Officer Toshio Hirai is shown at his memorial service on Friday at Green Hills in Rancho Palos Verdes. 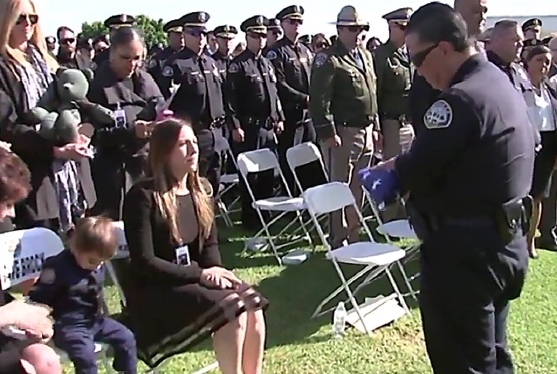 RANCHO PALOS VERDES — Gardena Police Officer Toshio Hirai, 34, was laid to rest last Friday following an emotional memorial service held outdoors at Green Hills Mortuary and Memorial Chapel in Rancho Palos Verdes. Gardena city buses shuttled mourners from the police headquarters to the cemetery, where a giant American flag was held aloft between two Fire Department ladder trucks. The chief recalled their first meeting, when Hirai asked to join Kang on a ride-along. Hirai was en route to work about 7:50 a.m. on Nov. 14 when he collided with a vehicle at Western Avenue and 238th Street in Harbor City. He died the following day, leaving behind a wife and 2-year-old son. Kristen Hirai remembered her husband as a hero and her best friend. Kristen Hirai receives a flag from Gardena Police Chief Thomas Kang. Hirai was a 12-year veteran of the police department and a member of its SWAT team. He also had his commercial pilot’s license and volunteered to fly organ donations. His parents Brigitta and Isao Hirai joined Kristen and grandson Takeo to express their gratitude for the support the family has received. Isao Hirai built the Ellison Onizuka monument in Little Tokyo. Rev. John Iwohara of Gardena Buddhist Church offered prayers and a Dharma message for the fallen officer. Gardena Mayor Tasha Cerda shared that Hirai, who spoke five languages, served as a translator when the City Council visited sister city Ichikawa in Chiba Prefecture. https://999-gardenapoa.firstresponderprocessing.com/. The Gardena Police Officers’ Association, in partnership with the 999 Police & Sheriff Foundation, created the web page, which is the only legitimate online donation site. As of Friday morning, about $76,000 had been raised, with a target goal of $125,000. Also, checks to assist the officer’s family, made payable to the Gardena Police Officers’ Association (GPOA), can be mailed to or dropped off at: Gardena Police Department, 1718 W. 162nd St., Gardena, CA 90247.